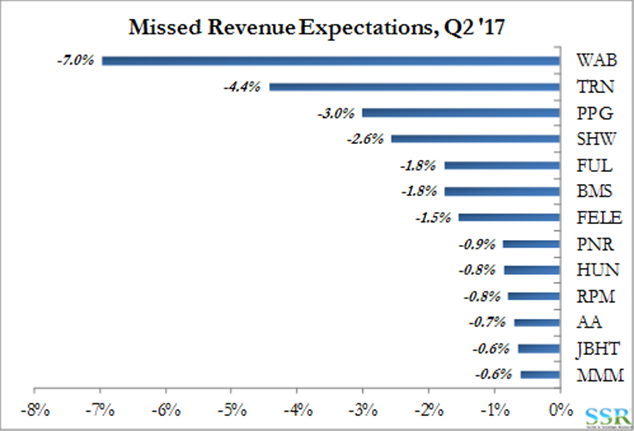 As the Q2 results roll in, barring a handful of outliers, we are seeing the majority of companies beat top line expectations, something that started in Q4 2016 and has not happened consistently for a while. For several years, we have had a pattern of cost reduction driven EPS growth – disappointing top line but EPS growth and often positive EPS surprises nonetheless. Over the last couple of quarters, we have seen top line improvements and revenue surprises, with the trend improving – see chart. While Q2 earnings are not yet done, we have enough data to show how much better 1H 2017 appears to be. 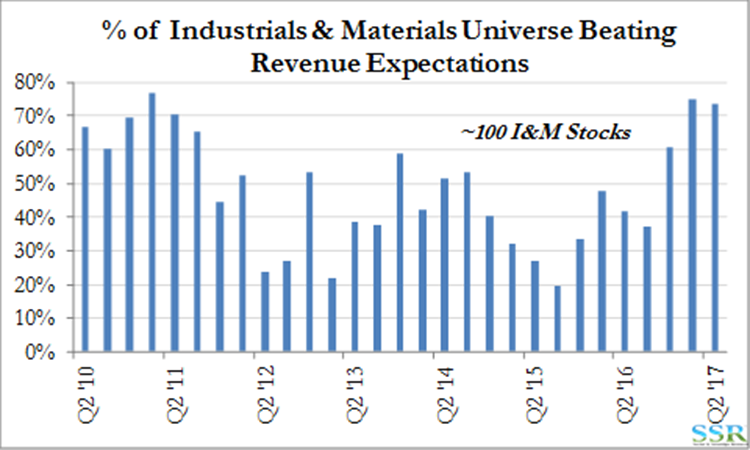 Some of the Q2 revenue disappointments are a function of market exposure – with PPG, SHW, FUL and RPM (see next chart) all suffering from a lack of growth in US architectural and other coatings segments. While the global economy is not growing quickly, it is growing, and in every region. As we have highlighted in the past, the consumer is a larger proportion of that growth than in the recent past and we can see the more consumer oriented businesses generally showing the strongest gains (the exception being architectural coatings in the US and Europe). Our expectation is that the growth drivers that have helped 1H 2017 will be in place for 2H 2017, barring some geopolitical shock. The market and many stocks under our coverage are discounting continued growth in our view. Whether or not companies have met or missed estimates – we are generally seeing better overall growth – bottom line and top line. Dow delivered a very strong “last” quarter against a backdrop of margin pressure in basic chemicals and plastics in the US. At the same time the company provided new data on why the proposed composition of the materials science company makes sense given the benefits of both integration and innovation. 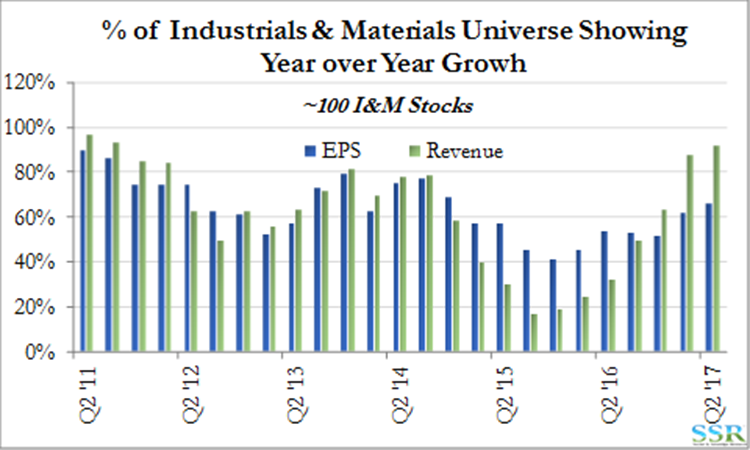 Dow is outgrowing its competition right now and has been able to deliver earnings growth in recent years with a consistency that we do not often see in the chemicals space. The top line growth surprise was driven by strong volume and pricing gains in many industries where underlying growth is much slower, suggesting that Dow is delivering the right product and is able to get pricing because of the quality offered. By contrast the BASF numbers this week looked to be of much lower quality, with gains in commodities and energy and earnings declines in almost everything “value added”. This may be an accounting issue as Dow reports on an integrated basis and it is possible that, especially in Europe, Dow made more money in the commodity end of the chain than the more value added end. Still, the quality of Dow’s earnings looked much better than the quality of BASF’s. At the same time, DuPont is also hitting the cover off the ball with earnings, and beating on revenues, the only relative disappointment being earnings in Ag, though much of the disappointment is coming from businesses within Ag that DuPont will be divesting. Over the less than two years that Ed Breen has been in charge he has set DuPont up to be on an EPS growth trajectory of more than 60% from end 2015 to end 2017 – something only achieved by prior management when bouncing off recessionary lows. 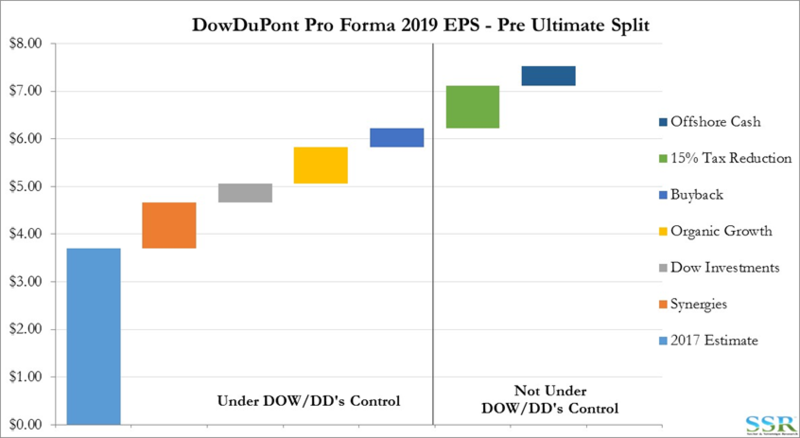 We have revised our combined company 2019 EPS estimate analysis based on the Q2 surprises on both Dow and DuPont and now have a pre-split, pro-forma, 2019 estimate of $6.20 per Dow/NewCo Share. We believe that we have been conservative on the organic growth – even factoring in the proposed divestments – and the contribution from Dow’s investments, especially if the ethylene chain is better in 2019. The growth rate and possibly a rebase of expected earnings volatility, should push up the multiple of earnings closer to DuPont’s historic average rather than Dow’s. It is not much of a stretch to put a target price for 2019 above $100 per Dow share as a consequence. See prior research. LYB put up a strong quarter, driven by better margins in Europe, better volumes in the US, and lower refining losses. In the earnings presentation, LYB showed integrated polyethylene margins in the US and Europe strong in Q2 and similar in July. What the slides do not show are export margins for polyethylene nor do they show what happened sequentially on the ethylene LYB sells, in the US. It is likely that this was not a large proportion of volume for LYB in Q2, but given the ethylene production growth that the company discusses, there was margin compression somewhere, or earnings would have been even better. 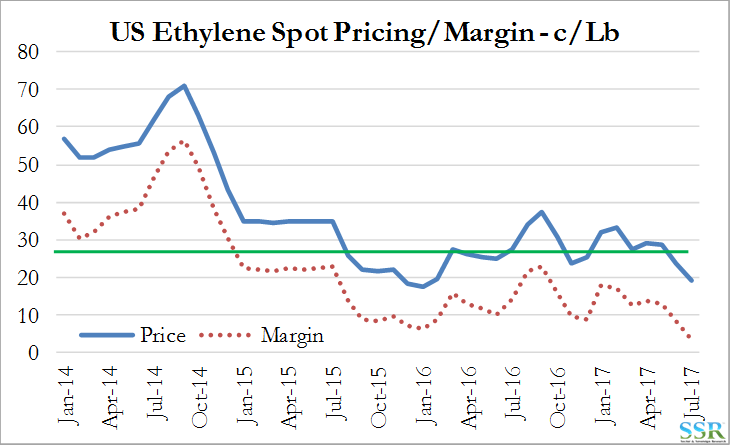 US spot ethylene margins have hit another multi-year low in July, having done so also in June. In recent research, we have talked about the potential for volatility in ethylene over the next 18 months and it is interesting that Woodmac is predicting an almost immediate recovery (in August), which would of course provide that volatility. In the chart, the green line is the MARGIN required to provide a 12% return on new investment for a greenfield new build – note that the current spot PRICE is below the required margin. The trade piece is the interesting one and is behind the “double edged sword” comment in the title. US ethylene pricing is now so low that US producers of any ethylene derivatives and ethylene itself can sell into almost any market in the World and get better netbacks than offered by the current spot market. This is a necessary dynamic as the US starts up more and more ethylene and ethylene consuming capacity as there is no home for most of this material in the US – so exports must rise. The question is whether the arbitrage will close through ethylene and derivative pricing falling in Asia and Europe or whether US ethylene pricing will recover. This comes down to whether US oversupply is global oversupply – which is at the heart of the ethylene controversy today. We believe that the additions in the US are not out of line with global demand growth, but the market and market commentators are nervous – hence our recent piece on volatility and hence the significant swings in pricing and margins in the US based on relatively innocuous data points. If the global market is oversupplied for a period – most likely from now through mid-2018 – the arbitrage will close mostly though international prices falling, as no-one outside the US is operating close to cash cost today except some coal based producers in China. We like the ethylene space on what should be a quick recovery in market dynamics and valuation, although, as covered earlier this week, we do not like LYB’s recent capital allocation decision and would buy WLK over LYB to play the expected upswing. WLK is a significant spot ethylene buyer for the Axiall vinyls assets and will be a beneficiary of sustained low ethylene spot prices. After the couple of weeks of bad news that Akzo has been through, one might expect the stock to be down materially – CEO resignation, major earnings miss, Chairman agreeing to step down (albeit not as quickly as one shareholder would like). There is very little debate that the incoming CEO has a significant and likely impossible challenge to live up to the guidance given at the time the company was fending off PPG. The news that the company has possible Private Equity interest in its chemical businesses has possibly been a boost to the stock, but we would argue that a sale of the business is likely very tax inefficient and probably not in the best interest of shareholders – it might make for a good headline and it might provide Akzo with cash to make other moves (the acquisition of Axalta, for example), but the company’s deep rooted optimism and lack of business “self-awareness” suggest that this is not a company you want to have lots of free cash! It is also possible that the stock is hanging in there because there is now hope of a PPG deal (or perhaps a deal with someone other than PPG). If Mr. Vanlancker is re-thinking the PPG offer – WHICH HE SHOULD – then the chemical business needs to stay, as Akzo shareholders will get the highest value for this business in a sale to PPG and we would expect PPG to then extract maximum value in an eventual separation. In the growing world that we discussed at the top of this email, the coatings sector is one of the few negatives. It is an industry (as industrial gases have been) where new strategies are needed to create shareholder value. If industry leaders like SHW and PPG cannot find growth and drive the earnings they want, then laggards like Akzo have little chance. If the Akzo strategy is to try and go it alone we see a future of value destruction, even if the company can get a big headline number for the chemicals business. Current pricing for the stock is only supported in our view by the hope of a larger deal.